This summer we took our house projects outside and kept busy landscaping. 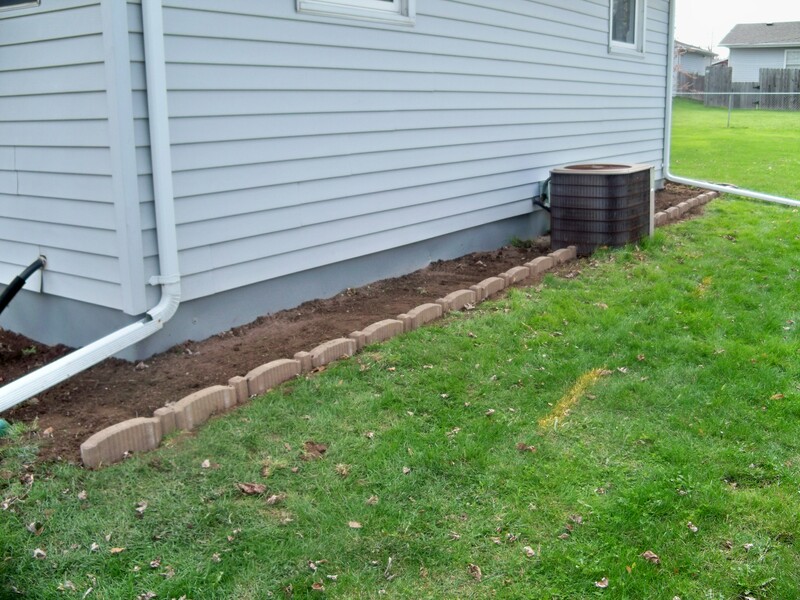 Last fall we took out the random plants that were sporadically placed around the house, with the plan of back-filling around the house and adding trim, woodchips, and plants. The project started over my spring break when we had a few yards of dirt delivered. I shoveled most all of the dirt around the house as a surprise for J before he got home from work. A week later we laid edging around the entire house and began planning what we would plant over Memorial Day weekend. 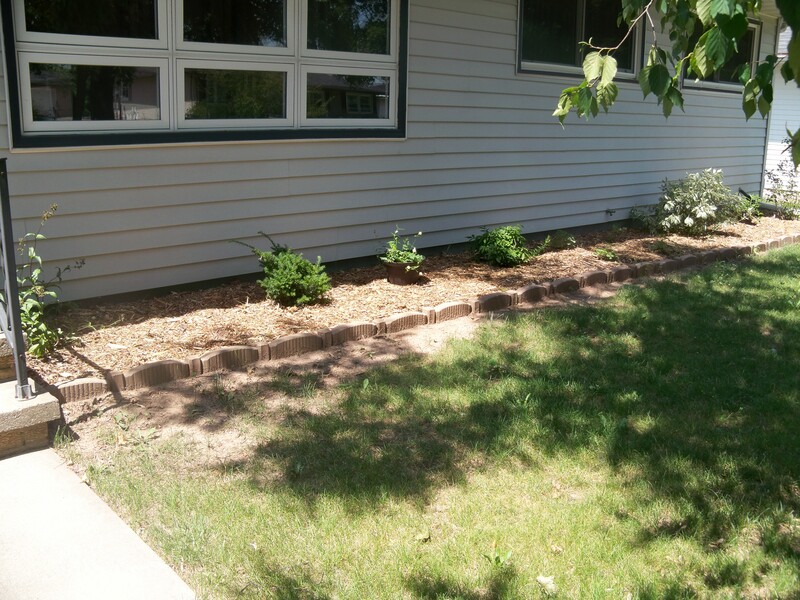 We started planting in the front yard, where we put (from left to right) a Husker’s Red Penstemon, Spreading Yew, Small Burning Bush, Yellow-Twig Dogwood, and Service Berry. They are all pretty small now, but some will be almost 8′ tall, so we need to be patient for them to grow. We put wood chips down around the plants to finish things off. After we did the front yard plants we moved to the side of the house. I had 2 weeks off before I started my summer research project, so I spent a few days planting hostas; we purchased a large box of them from someone off Craigslist for only $5. I didn’t get a chance to take any pictures, so I’ll update it next year. Our next project was the garden, which I have already posted about here. In early July J went up north with the guys and I decided to try to work on the back of the house. My aunt had extra mums and flowers around her house that she was going to throw away. Despite the drought we were having, I figured I would at least try to plant them. The worst case scenario is that they die and we start over next year. I spent 2 days digging up the horrible weedy dirt, planting these flowers, and laying down wood chips. I am pretty pleased with the results. In the back of the bottom picture you can see our clothes line that we put in as well. I have been wanting a clothes line since we moved in, so I was really excited when we finally committed to digging the holes this summer. My dad has an old-school post-hole digger we borrowed. 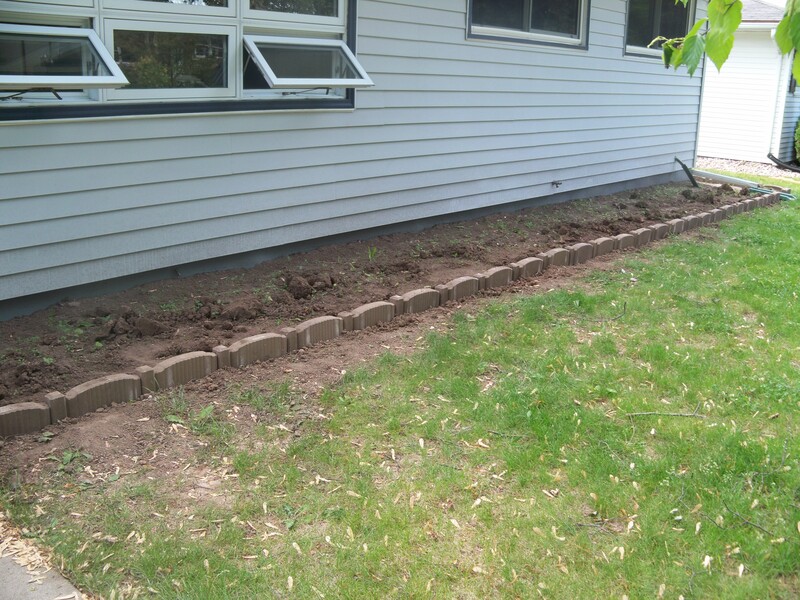 I actually liked digging the holes (since I only had to do 2) and ended up putting most of the clothesline in myself. After reading this you are probably wondering what J was up to all of this time – don’t worry, I was keeping him busy. Our biggest project was to build a pergola in the back corner of the yard.Originally, we wanted to put in a patio, but after learning it would cost more than $1000 to get a simple concrete patio, we figured we could save some money and put in a nice seating area in the back. 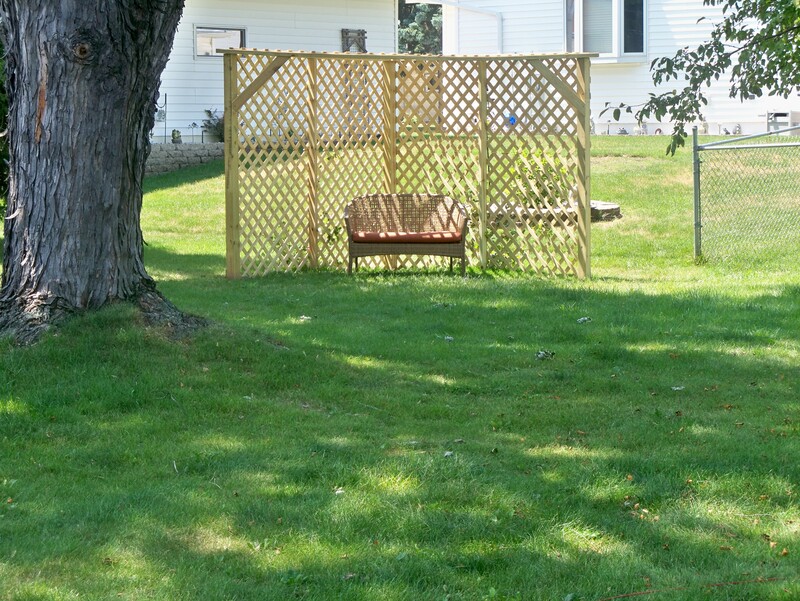 Thanks to pinterest, I got some great ideas and designed a corner pergola. My timing wasn’t the greatest, as we ended up putting it in over the 4th of July weekend – probably the hottest and driest weekend of the year. We started at 7:30am, but it was already in the 90s and humid by 11am. Needless to say, we got it done by the end of the weekend and are loving the results. While J was up north with the guys, I planted two honeysuckle plants to grow up the sides of the Pergola. This year didn’t go that well for them, but Schmalz has a 1 year warranty, so if they don’t grow back in the spring we’ll get some new ones to try out. 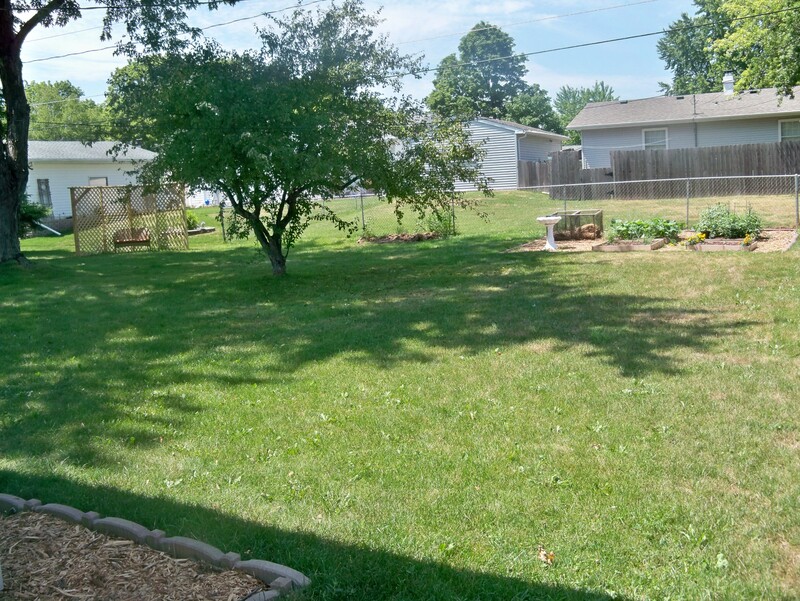 It has been great seeing how much different the yard can look with a little elbow grease. The best part of all was the price tag. 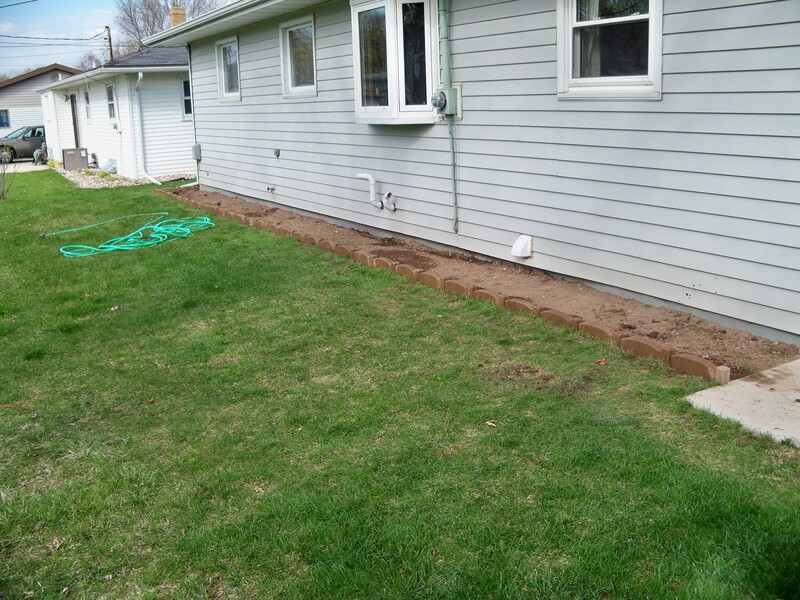 Had we just done a patio and nothing else, it would have cost at least $1000. After everything was said and done, our total cost was only $651. This entry was posted in Life and tagged curb appeal. Bookmark the permalink.